Graduate student setter Stacey Benton sets the ball during volleyball's Saturday night game against Saint Louis. Volleyball was unable to capitalize at crucial points in its final game of the regular season, falling to Saint Louis at home Saturday night for the team’s second consecutive loss. The Colonials (10-20, 6-8 A-10) forced the Billikens (13-14, 10-4 A-10) into extra points in both of the first two sets, but ultimately lost 3–0 for the 12th time on the year. The loss pushed GW into a fifth place tie with Rhode Island in the Atlantic 10 standings, with playoffs starting next weekend. Based on a head-to-head tiebreaker, GW enters the six-team conference tournament with the No. 6 seed after missing out on the postseason last year. In the single-elimination tournament, the Colonials will take on No. 3 Saint Louis again Friday Nov. 17 at 5:30 p.m. The winner of that game will play No. 2 Dayton the following day. In order to snap the losing streak and play multiple tournament games, outside hitter Aaliya Davidson said the team would have to improve its execution in the serve-receive. GW finished the day with eight return errors and zero service aces. Graduate student setter Stacey Benton finished with a team-high 36 assists as the team’s only setter due to an injury to sophomore setter Jaimeson Lee. Bernson said they would be going with the same lineup next weekend, but they’d need more information to see if Lee or sophomore outside hitter Jordan Young can return from injury. The contest was the final competition in the Smith Center for six of the players. Seniors libero Gillian Kane, senior opposite Kristel Moor, Davidson, Newell and junior middle blocker Alexis Lete plan to graduate in the spring and Benton is now in her final year of eligibility. Freshman outside hitter Marianna Warren had a standout offensive performance, totaling 11 kills on the night. Moor and Davidson combined for 18 kills as the next two highest contributors. A close first set found Saint Louis on top, winning 26–24. 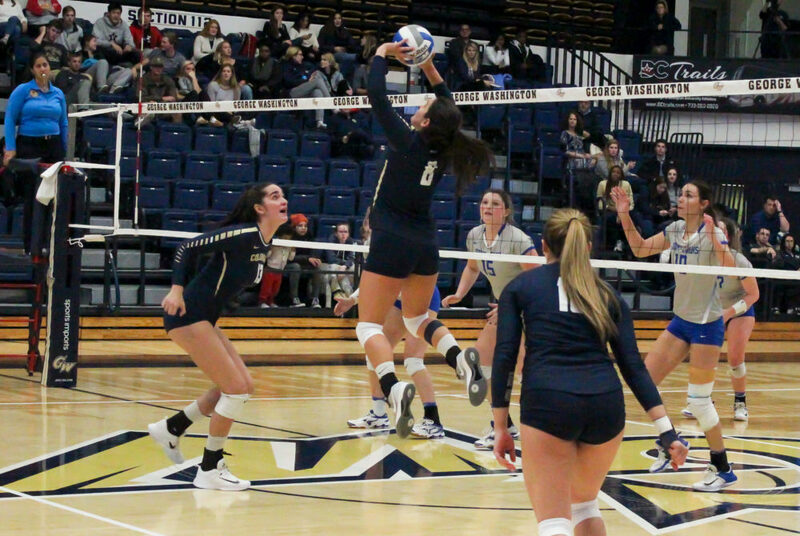 Kills from sophomore outside hitter Skylar Iott and Davidson gave GW a 23–21 lead and forced a Saint Louis timeout, but ultimately three consecutive kills by Saint Louis won the set. In the second set, the Colonials went on a 10-3 run, giving them a 24–23 lead. Warren and Moor combined for five kills to account for half of those points. Again, the Billiken attack took control at the end of the set, finishing with kills in four of the final five points and winning 27–25. Saint Louis immediately jumped to a lead in the beginning of the third set and GW never regained the lead. The Colonials swung for their lowest attack percentage of the game at .125 and the Billikens went on to win the set 25-15 and clinch the victory.